Silverfish and firebrats are cosmopolitan, nocturnal insects belonging to the order Thysanura. They eat a wide variety of foods, but they prefer carbohydrates and protein, as indicated by the scientific name, Lepisma saccharina L. They have been observed eating glue, wallpaper paste, book bindings, paper, photographs, starch in clothing, cotton, linen, rayon fabrics, wheat flour, cereals, dried meats, leather and even dead insects. Silverfish often live in damp, cool places such as basements and laundry rooms. Sometimes they are found in a bathtub, sink or washbasin, where they are unable to climb out. Firebrats, as their name suggests, prefer hot, humid places such as attics in the summer and furnaces, fireplaces and heat pipes in the winter. Silverfish and firebrats are pests due to their nibbling on paper, infesting of dried foods or chewing of holes in clothing, but they are generally considered harmless. Silverfish and firebrats are very similar in appearance. Both have flat, elongated bodies, ⅓- to ¾-inch long, and both are broad near the head and taper toward the rear, giving them their fishlike appearance. Silverfish have tiny silver scales, while firebrats are generally more dull grey in color. These wingless insects have two slender antennae, nearly as long as the body, and three long, antennaelike appendages (two cerci and a medial filament) at the tip of their abdomens. Silverfish and firebrats are nocturnal, fast-moving insects. When objects are moved where they are hiding, they dart out and seek new hiding places. 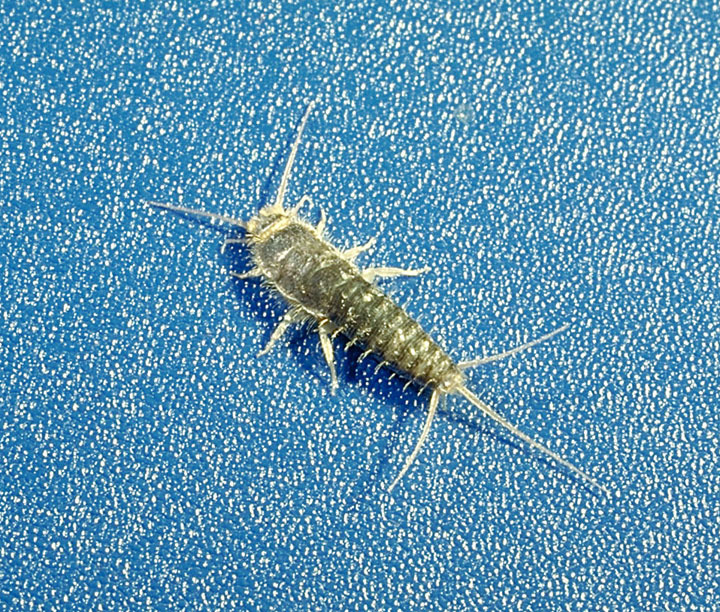 Silverfish live and develop in damp, cool places (preferring 75 to 95 percent relative humidity), often in the basement, bathroom and kitchen. Large numbers may be found in new buildings where the walls are still damp from plaster and green lumber. The firebrat prefers to live in dark places above 90°F, such as around ovens, furnaces, boiler rooms and fireplaces. They can also be found near insulation around hot water and heat pipes. These insects follow pipelines from the basement to rooms on lower floors, living in bookcases, around closet shelves, behind baseboards and behind window or door frames. They are hardy and can live without food for many months. Firebrats and a related species can also infest houses that use shake roofing. They can tolerate the high temperatures and apparently feed on the molds and mildews that grow when the roofing gets wet. Female silverfish can lay approximately 100 eggs during a lifetime. Eggs are laid singly or two to three at a time in small crevices, hatching in two to eight weeks. Young silverfish and firebrats resemble adults except they are smaller. Upon hatching, nymphs are white and then begin to darken with subsequent molts. Adults may live two to eight years. Firebrats lay about 50 eggs at one time in several batches. Eggs hatch in about two weeks under ideal conditions. Both species can go months without feeding. Silverfish and firebrats, depending on the species, may reach maturity in 3 to 24 months. These insects normally hitchhike into the home in food containers, furniture, old books, papers and old starched clothing. Unlike other insects, they continue to molt after becoming adults. Forty-one molts have been recorded for one firebrat. Populations do not build up fast. A large infestation in the house usually indicates a longtime infestation. Sanitation is important but not entirely effective in reducing populations because these insects often reside between wall partitions, in insulation materials, in books and papers, among bookshelves and in other protected places. However, be sure to remove old stacks of newspapers, magazines, papers, books and fabrics, plus foodstuffs spilled and stored for long periods of time. Often reducing available water and lowering the home's relative humidity with dehumidifiers and fans is helpful. Repair leaking plumbing and eliminate moisture around laundry areas. Lighting a dark, sheltered area may force these insects to move to new sites where they can be controlled more easily. Once the infestation has been eliminated, sanitation will help prevent reinfestation. Infestations occasionally occur in bathroom carpets where cornstarch-based cosmetics fall into the carpet nap. This starch serves as food for the silverfish. Likewise, infestations can also occur in the carpet of living rooms and dens where snacks or other foods are frequently eaten. When in carpets, frequent vacuuming and cleaning usually will eliminate the infestation. Sticky traps can be used both as monitoring devices and as small population control of silverfish or firebrats. Ensure proper ventilation and maintain repairs to minimize moisture problems that encourage infestations. Seldom seen insects can also be vacuumed when encountered. Insecticides are generally not needed for management. However, for heavy infestations, treatments should be applied thoroughly to all potential hiding places such as in and around cracks and crevices, inside floor moldings, around steam and water pipes, in and behind seldom moved furniture, and in and around closets and attics. It may be necessary to drill small holes in the walls to treat large populations in wall voids. Control may not be immediate since insects in wall voids must move out and contact the insecticides. It may take 10 to 14 days. Residual sprays can be used if needed and may be applied in attics, crawlspaces and other hard-to-reach areas. Likewise, dusts are effective in places where sprays are hard to reach such as in wall voids, in crawlspaces and in attics. Other insecticides labeled for "restricted use" can be applied only by a licensed pest control operator or applicator. Before using any insecticide, always read the label and follow directions and safety precautions. It is advisable to use the services of a reputable, licensed pest control operator or applicator when infestations are persistent or the source of the insects is hard to locate. This fact sheet is a revision of HYG-2108.